Is it time for Dublin’s monthly Critical Mass cycles to grow? GUEST COMMENT: Niamh, who takes part in Dublin’s Critical Mass, explains what it is all about and why you should give it a try. In 1992, Critical Mass was borne out of a frustration of how cyclists were treated on the roads of San Francisco. It began as a ‘ride home together’ with just 20 or 30 friends, to try and experience briefly what it was like to be the dominant form of transport on the streets. From there, it grew organically and it is now a worldwide phenomenon. Critical Mass (CM) is often called an ‘organised coincidence’ because it is rarely structured beyond the date, time and starting point. Every participant (a masser) has a say and is encouraged to be responsible in making Critical Mass what they want it to be. It offers a chance for us cyclists to gather and explore our streets in a new, more collective way. There is no intent beyond the action of gathering at a predestined point and cycling together. Although CM has no ulterior motive, as cyclists we all have our reasons for cycling and for attending Critical Mass. Personally, when I look around my city, I see that recently there has been a great boost in the cycling population. A vast variety of people, gliding through the city on two wheels. Although we share this mode of transport, often I find that the words ‘cycling community’ have only a loose attachment to Dublin cyclists. Yes, we share this way of navigating the city, but there is no visible community of which to be a part. I want somewhere to meet and share ideas or just enjoy cycling along with my fellow velocipedists. Critical Mass, for me, is a way of giving a time and place to encounter this transient community. You are not buying into anything, there are no commercial gimmicks. We gather, we cycle and we celebrate, an often mundane activity, in a festival-like manner. There is music, sometimes food, often themes and costumes. We wave and ask people to come and cycle along with us, ring our bells when groups of people stop to look. It is a unique feeling when bikes suddenly become the main traffic on the road. You see how social and fun traveling can be and how different the city is when you traverse it slowly together. Everyone has their reasons for cycling, whether they are environmental, health or socially driven. All of these motivations urge us to hop on our push bikes. This is why Critical Mass make sense. It is a shared celebration of the main common denominator: cycling bikes. It’s openness and lack of intent give us the space to investigate our ideas through social engagement and critical exploration of our city. This simple idea of gathering on our bikes to celebrate cycling, helps us enact a vision of reality where us and our bikes are principal instead of peripheral. If you haven’t been a part of a Critical Mass, you should try it at least once. What are your reasons for cycling? You should come down, take art and have a chat about what get’s you on your bike! 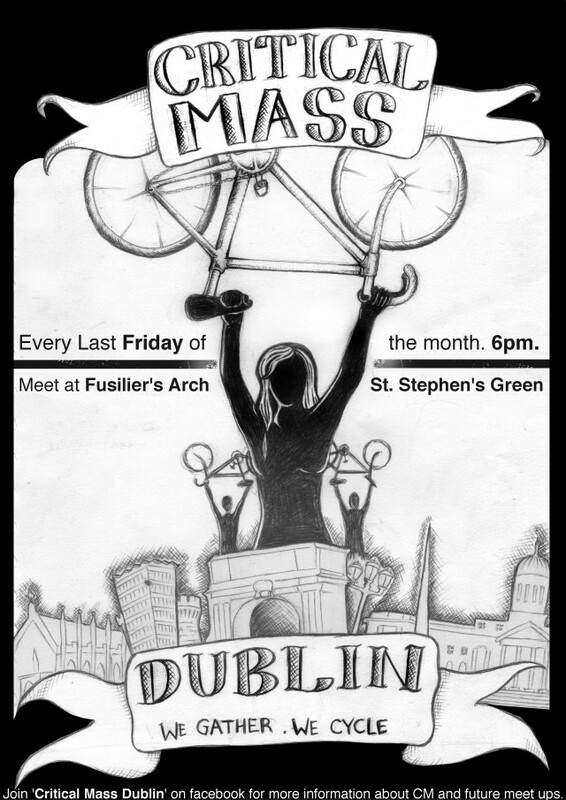 Meet us at 6pm on the last Friday of the month at Fusilier’s Arch, St Stephen’s Green. The upcoming Critical Mass events are: today, Dublin Friday 30th January; and Belfast Saturday 31st January. IrishCycle.com aims to publish a wide-range of opinion. If you have an idea for a comment article relating to cycling, please write to cian.ginty@gmail.com. Love the idea….but Friday 6pm hardly ever works for me! But overall we in Dublin Cycling Campaign support you….Fire Away! By the way a lot of people also have ‘economic’ reasons for cycling! Hey, Niamh here, there has been mention of the time maybe not suiting everyone. If a weekend day suits people better then we can and should change it! And yes, I think economic reasons is a massive factor in cycling! And also a reason why Critical Mass is great, it’s free!